I LOVE practicing West Side Story. I realized today, as I was working through the fugue portion of "Cool" in the Symphonic Dances from West Side Story, that I was reluctant to leave my folder at rehearsal tonight as I would always otherwise do. 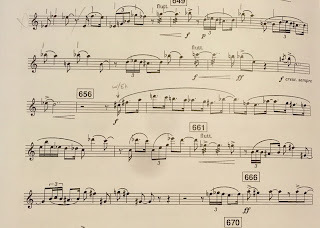 I know the part, I've performed it many times, but I feel like I could work through these weird tritones and swing rhythms and aggressive flutter tonguing every day without getting tired of them. It's not that I need more practice, it's that I don't want to stop playing. It's not merely that I grew up knowing this music and that it's nostalgic for me - my mother played hundreds of musical theater records in our home and although I can sing every word to every song in that Great American Songbook my heart does not thrill when I play Oklahoma on the oboe. Bernstein is special. Smart. The melodies are SO beautiful, the angles and turns that the harmonies take are SO striking. I never, never ever get tired of it. And playing it is difficult in the best way. On the same concert we are playing Elgar's Enigma Variations. I love this piece, it's pretty all the way through, but in my part there are not long continuous melodic lines to grab on to. There are not extensive technical passages that require my practice and attention. No, what's hard here is finding the exact right velvety sound for the entrances, making sure that my slurs are gentle, that my lines have an appropriate warmth without being overwrought. Legitimately difficult tasks, but not that much fun to practice alone. We are opening with John Adams's Lollapalooza. It's a very neat piece, a high energy minimalist work, in which the challenge is primarily CONCENTRATION. 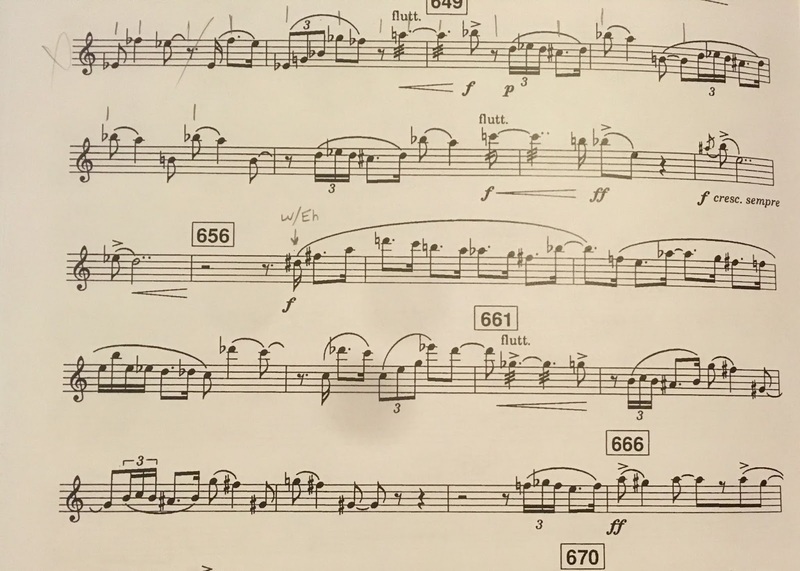 With a few minor exceptions nothing is technically difficult, but counting the rests and not falling in holes is a significant challenge and will require intense concentration for the entire duration of the piece. My practicing here has consisted of metronome work and math and pencilled hatch marks to help me keep my place in the beats. There's something enjoyable about this, sure, and the end result will be COOL, but after this weekend I won't miss practicing it. stains. Glissandos and flutters. The intervals are inherently interesting - I love tritones and sevenths. I'm not just ducking in and out of the lines, but playing substantial passages. It's FUN. You should come to our concert. You'll have fun, too. Saturday night, 7:30pm, DeBartolo Performing Arts Center at Notre Dame. Details HERE.